Taken from Napoleon’s Everday Gourmet Burgers. THE BURGER: In a food processor or meat grinder, grind the halibut until smooth. Transfer to a bowl and add chopped crabmeat, wild rice, carrot, onion, green onion, garlic, butter, Parmesan cheese, egg, panko bread crumbs and Orgasmic Onion Burger Seasoning. 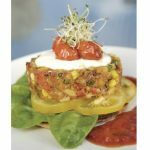 Form into eight 4-oz (120 g) burger patties approximately 3 to 4 inches (7.5–10 cm) in diameter and 1 inch (2.5 cm) thick. Once you have made the 8 burgers, place a slice of pancetta on either side of the halibut burger and press firmly so that the pancetta sticks to the burger. Place on a parchment-paper-lined plate, cover and refrigerate for a minimum of 1 hour. Preheat grill to medium, 350–450°F (175–230°C). Grill burgers for 5 to 6 minutes per side, until fully cooked and the pancetta is crisp on the outside. ASSEMBLE YOUR BURGERS! 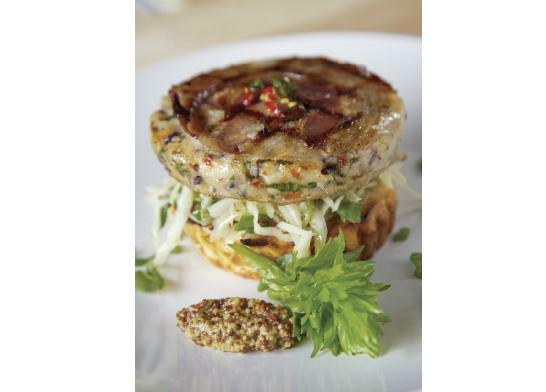 Brioche bun, Mustard Coleslaw (see recipe below), pancetta-crusted halibut burger and add Brioche bun top. In a bowl, combine cabbage, white onion, green onions, mustard, cider vinegar and oil. Season to taste with salt and freshly ground black pepper and set aside.